I got an email out of the blue from someone named "Drunker than Satan" with a free mp3. 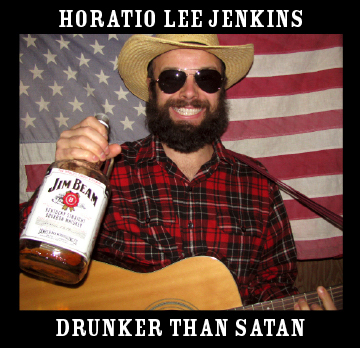 The song is "Drunker than Satan" by none other than Mr. Horatio Lee Jenkins, for those of you that are so inclined, he has a MySpace page. I know what you're thinking, 'what the hell does this have to do with anything?'. It doesn't. It was one of the rare unsolicited emails I get to my cnybrew.com email address and I decided to listen to the song. Since then, I have been humming and singing it so they must have done something right. It's funny, but it's actually not a bad song at all. I was a big Bloodhound Gang, Southern Culture on the Skids, Reverend Horton Heat fan so this was right in line with all those classics. Anyway, I enjoyed and thought you might too. Cheers! I like the Horatio Lee Jenkins song, too. Did you catch that this was Hank Williams, Jr.? The video is a viral marketing ploy. It works well. Really? He seems a tad young for HWJ, I remember my parents had HWJ cds when I was a kid and he was in his 40s then.